This is just a nice warm salad I wanted to share which is really filling and full of goodness. Tempeh still feels like a luxury ingredient to me as its something I was never fortunate enough to get donated very often on the ships, so I rarely got to cook with it. I remember getting so excited if we ever got tempeh donated and then I never knew what to do with it… especially when you only get one small block to share around a crew of 30! Its so exciting being home and having more choice of ingredients… something I will definitely miss when I return to Africa in a months time. So here you have it – my first indulgence of tempeh since being back home. Start by heating the oven to 200°c and roasting the beetroot in 1 Tbsp of the olive oil for 20-25 minutes. Next heat the remaining olive oil on a medium heat in a large frying pan. Add the sliced onions and soften. Then add the lentils, chorizo and red wine vinegar, turn up the heat and stir until heated through. 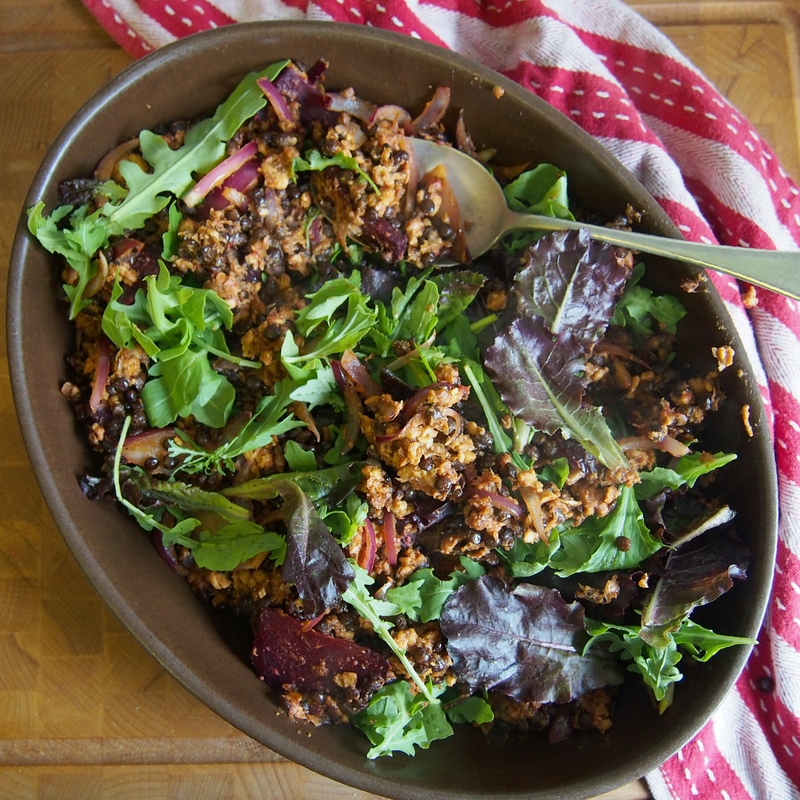 Add roasted beetroot and serve warm over a bed of rocket. 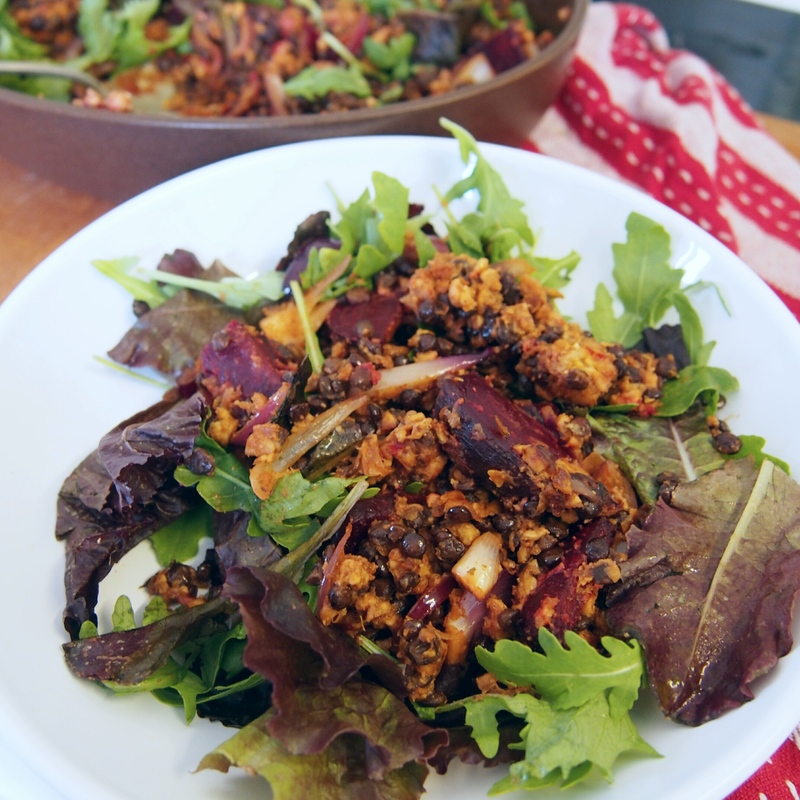 Heat oil in a large frying pan and crumble in the tempeh, cooking and browning on all sides. Whisk together in a jug the remaining ingredients, then pour over browned tempeh and bring to the boil. Simmer liquid for 5-10 minutes until liquid has been absorbed and evaporated. I like to then turn up the heat a bit and browned the tempeh once again to get it a bit crispy. 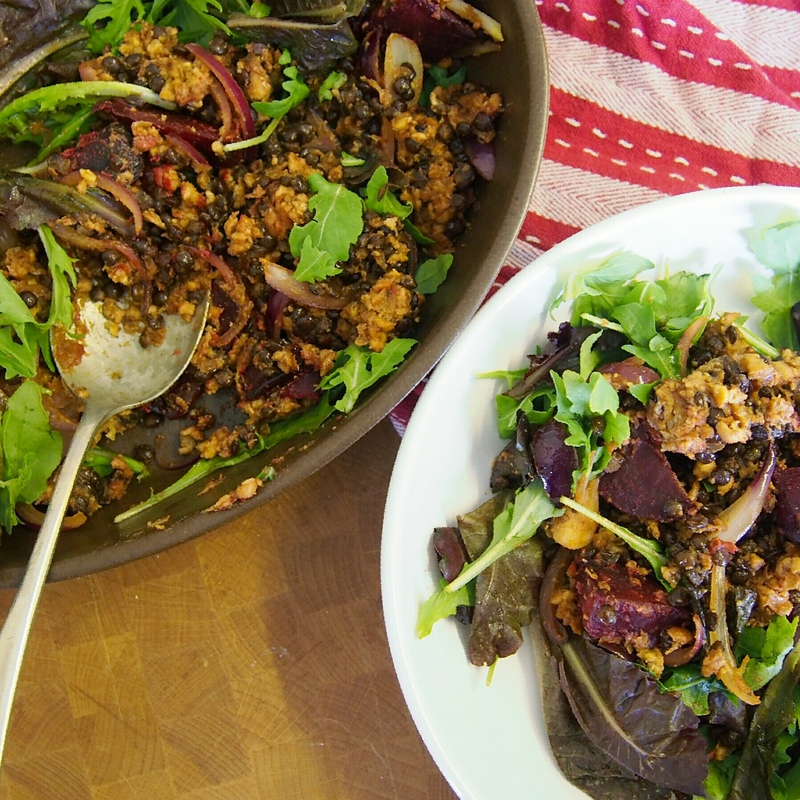 This salad has all of my favorite things: tempeh, beetroot, lentils! Thanks for sharing, it looks amazing!! !